Acid Rain or acid deposition is any form of precipitation with pH of about 5.2 or below due to high levels of nitric and sulfuric acids. It can also occur in the form of snow, fog, and tiny bits of dry material that settle to the earth. The phrase Acid Rain was first used in 1852 by Scottish chemist Robert Angus Smith during his investigation of rainwater chemistry near industrial cities in England and Scotland. Human activities; burning of fossil fuels release gases into atmosphere. Rotting vegetation; decaying release chemicals into atmosphere. Erupting volcanoes; Magma contains dissolved gases, which are released during eruptions. How is Acid Rain Produced? 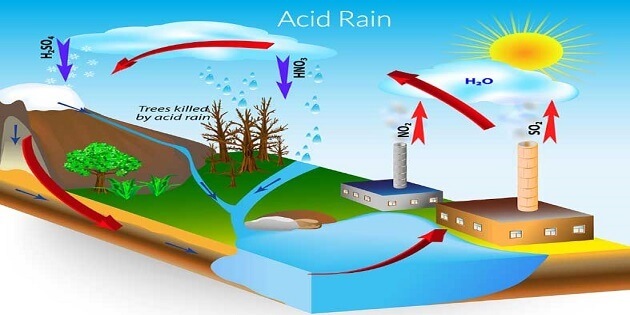 Acid rain is produced when gases like Sulphur dioxide (SO2) and Nitrogen oxides (NOx) are released into the atmosphere due to burning of fossil fuels or natural phenomena. These chemical gases react with water, oxygen, and other substances to form mild solutions of sulfuric and nitric acid. Wind spreads these acidic solutions across the atmosphere and over hundreds of miles. Lowers water PH making it acidic; affecting aquatic life. Acid rain can be prevented by curbing the release of the pollutants that cause it. Proper dumping of industrials wastes. 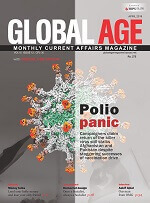 In Lahore, Smog became ‘Fifth Season’ in winter of 2017. As discussed in definition, acidic fog is a type of acid rain.